The focus of this tutorial is to learn how to create OSGI bundle in AEM and deploy it. This tutorial is intended for AEM beginners who are facing issue in creating there first OSGI service. Create a mvn archetype project. 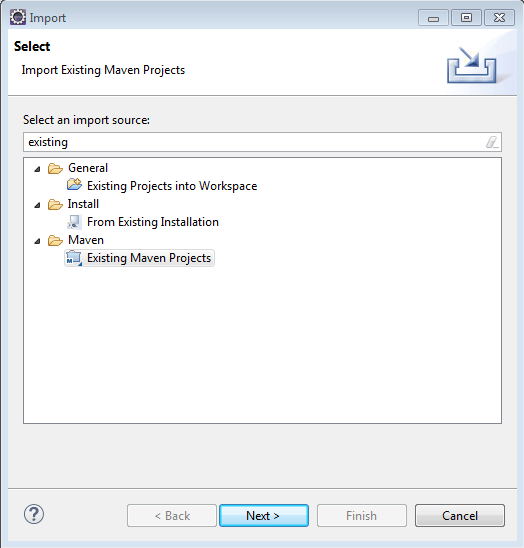 Importing Maven Project in Eclipse. Building OSGi bundle using Maven. How to Deploy a Bundle to AEM. Display Data on JSP from OSGI Service. Open command prompt and go to your working directory (for example, C:\Projects\practice). mvn archetype:generate -DarchetypeRepository=http://repo.adobe.com/nexus/content/groups/public/ -DarchetypeGroupId=com.day.jcr.vault -DarchetypeArtifactId=multimodule-content-package-archetype -DarchetypeVersion=1.0.2 -DgroupId=com.aem -DartifactId=MyFirstOSGIBundle -Dversion=1.0-SNAPSHOT -Dpackage=com.aem -DappsFolderName=aemcq5tutorials -DartifactName="MY First OSGI Service" -DcqVersion="5.6.1" -DpackageGroup="Aem Cq5 Tutorials"
When prompted for confirmation, Specify Y. Now you can import your project into Eclipse. 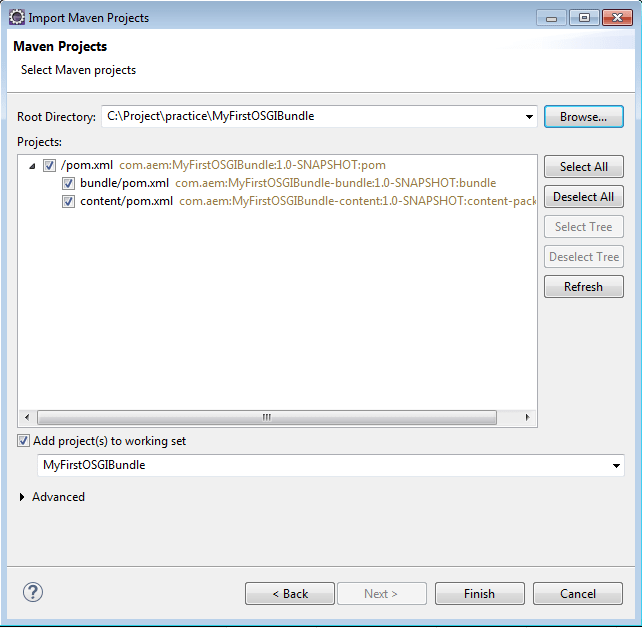 Open Eclipse and go to File–>Import–>Existing Maven project. Browse the path of the directory where your project was imported & click on Finish. You should now see the project imported in your eclipse. This sample project will have many extra files so don’t worry about them. You can either let them be where they are or else delete them in case you do not want them to be a part of the bundle. We are concerned with MyFirstOSGIBundle-bundle. 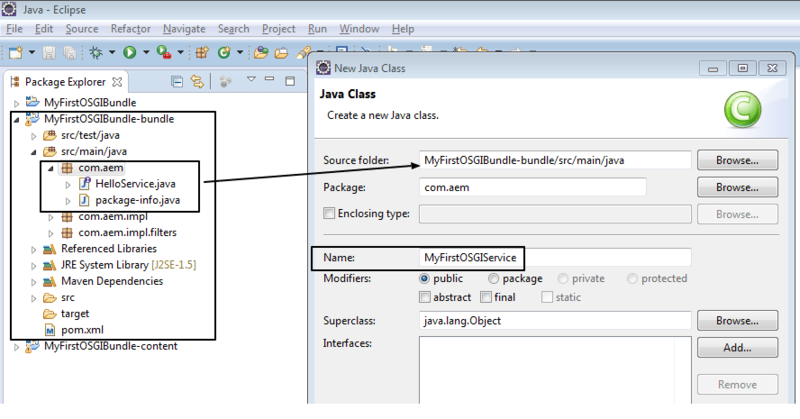 Now create a package or java file inside the MyFirstOSGIBundle-bundle where you want to keep your java files. Write your own custom logic or paste the below sample code. 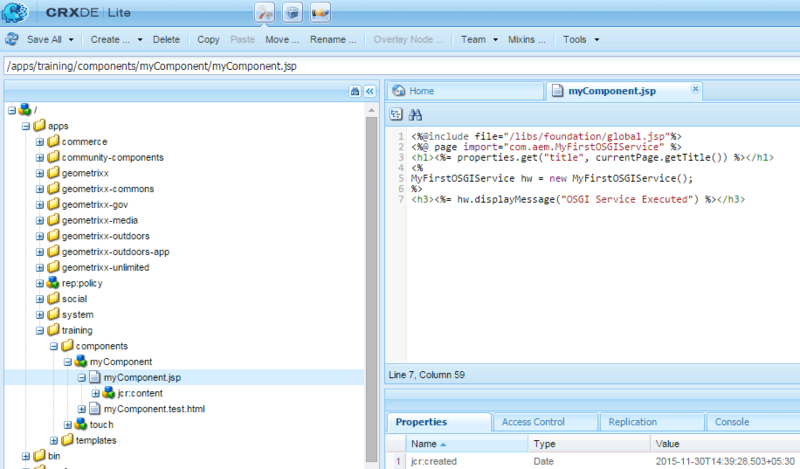 * This class is used to display a message which user sends from jsp. Upload bundle automatically to project MYFirstOSGIService. Upload bundle manually to any project. Start your author instance and create project with same name as Artifact Id mentioned in pom.xml i.e MYFirstOSGIService. Open command prompt and execute below command. Note:-You have to be in the directory where project pom is located. In our case it is MyFirstOSGIBundle folder. Once above command gets executed you should be able to see the bundle inside install folder. Open command prompt and go to your project folder. i.e C:\Project\practice\MyFirstOSGIBundle folder. The OSGi bundle can be found in the following folder: C:\Project\practice\MyFirstOSGIBundle\bundle\target. 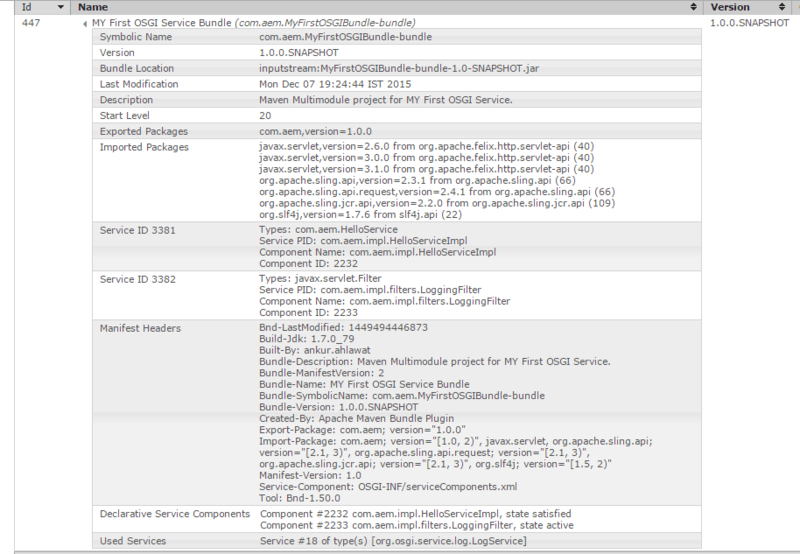 The file name of the OSGi component is MyFirstOSGIBundle-bundle-1.0-SNAPSHOT. Click Install/Update on Top-right corner to open bundle upload window. Select check box for start bundle, to start bundle immediately. Upload the jar file and click install. Your OSGi bundle is successfully created and deployed. Double click on your page in siteadmin. Your page should display message from osgi service. Another Way of executing OSGI Service is using sling.getService. Create an Interface which call our main class. Click Here To Learn How to Create Multi Module Project in AEM using AEM Plugin. 5 Responses to "Create OSGI Bundle in AEM"
Thanks scott 🙂 will try my best to help community members. Im using 6.3 and getting the below error. [WARNING] Archetype not found in any catalog. Falling back to central repository. [WARNING] Add a repsoitory with id ‘archetype’ in your settings.xml if archetype’s repository is elsewhere.